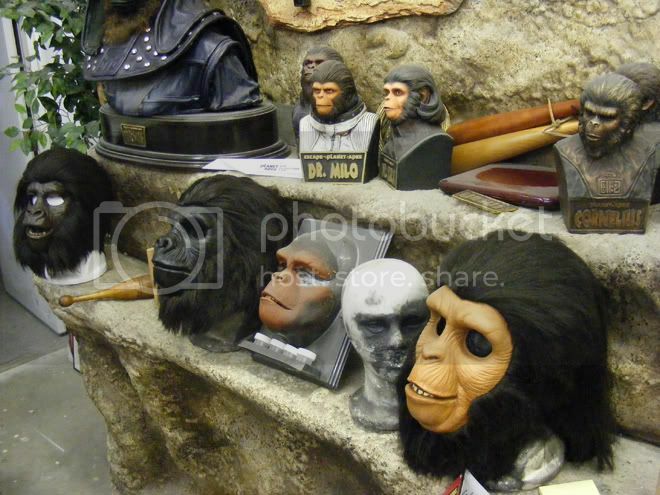 I saw some great Planet Of The Apes masks on a site called Ape Mania that sell Licensed Planet masks. These look really great! Any reviews? The sculpts on these masks are very good. Some, like the Cornelius, is a tad on the large size, but nothing too offensive. The only real complaint with these masks is the way they are haired, which is kind of a one-piece deal. Now, the actual hair looks pretty good, but they do this funky thing around the hair-line that kind of folds the hair under, which really ruins an othewise beautiful mask. This is kinda hard to see in the pics, but it's there if you know what to look for and is very noticeable in person. Having said all this, these are still VERY nice masks and well worth the money if you're looking for a good, old school Planet of the Apes mask. Is the latex thick and does the rubber cover the whole head? Or are they 3/4 mask with the hair covring the back? Yes, the masks are of a very decent thickness and they cover the entire head. Also, regarding the size of the masks, while I've never tried it on, my good friend Dave, has a Gorilla Warrior mask, and he if I recall correclty, he said it fit very well, unlike the Cornelius mask that is just a tad on the large size. 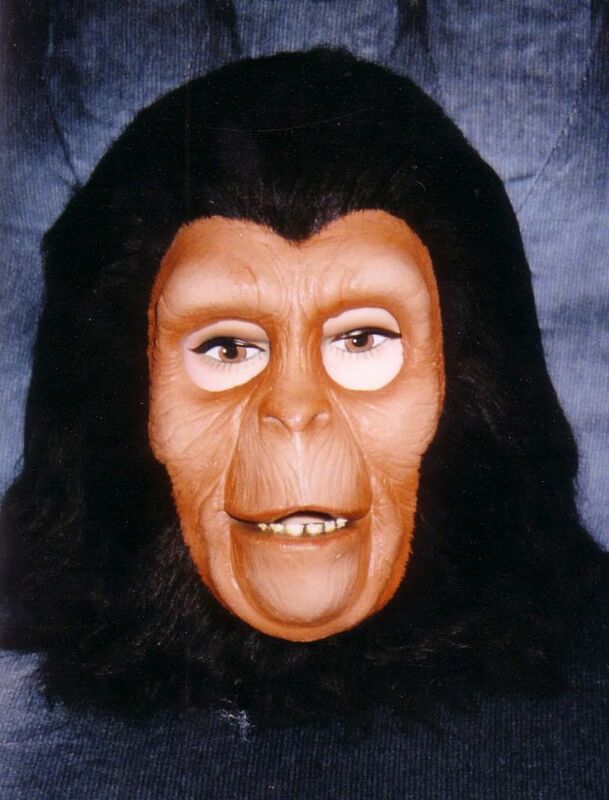 As well, the darker-skinned Gorilla masks don't show the funky hair folds quite so much. Below is a picture that was taken while a group of us were visting Apemania a while back. Wow! They look great! I know they sell the gorrillas, cornelius, zira, ursus, julius ect. Wow, if I was into the planet of the Apes, I would definitely order from them. Love those lifesize pieces. Really cool! The masks fit great and I cannot say enough good about the great folks at Apemania. Truly a dream come true to see their studio and meet them in person. This guy looks like he just stepped off the movie set!!! Add the Ape Mania studded collar and he would look just like General Aldo from BATTLE!! I agree with everything rezman said. 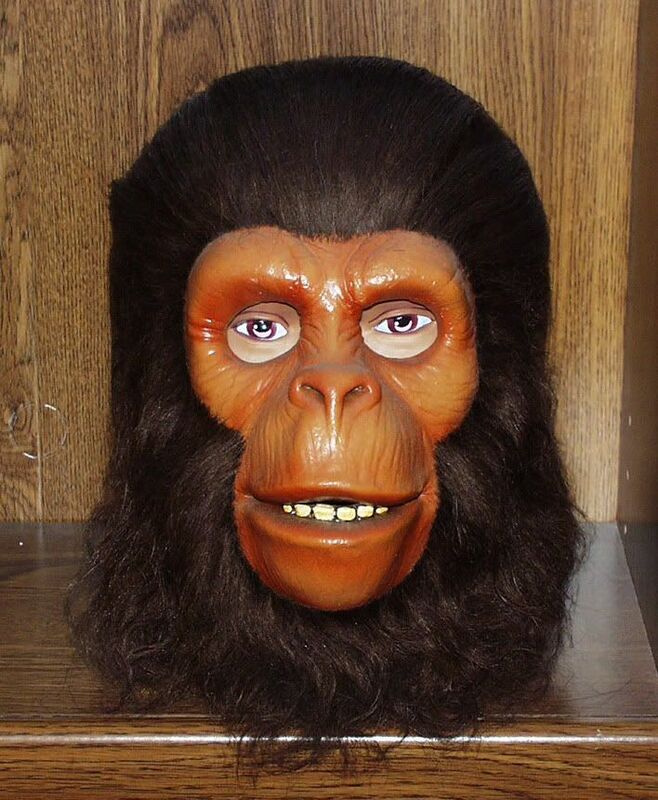 The Ape-Mania masks I've seen (and purchased) are some of the best reasonably priced masks being offered these days. They boast excellent sculptures, fine professional paint work and best of all (gasp!!) they are cast nice and THICK and sturdy enough to satisfy collectors! The very talented Brian P. at Ape-Mania is wonderful to do business with, too. I found him to be a very courteous, attentive, cordial and professional guy, and I couldn't be happier with our various transactions. He gets a 100% positive recommendation from me. 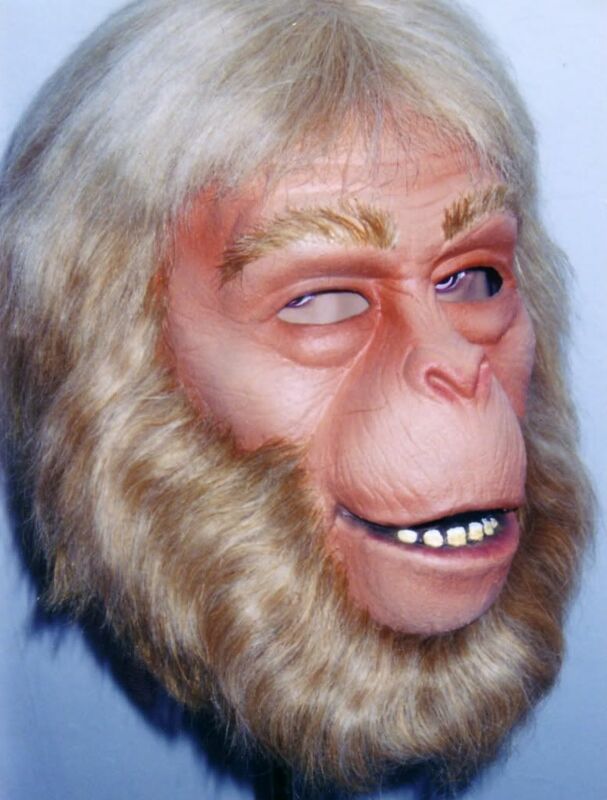 That said, I was honestly not happy with the folded-under edges of the hair on the Cornelius, Zira and Zaius masks, nor the stiff, shiny type of hair used on them. I can't say this is a complaint, exactly, since the masks are still just beautiful and a good value when you consider you're getting a well-made movie character mask with a full head of hair! Laura rehaired my Cornelius, Zira and Zaius for me, and I think they look much better now. I left my Gorilla Guard alone, though, since (as noted in an earlier post) he really looks just fine the way he comes, mainly because his skin and hair are the same color (black). I will attach photos of my set,,,, see what you think. Hey David, Laura did do a great job on the hair! I likeee! Speaking of my other friend Dave, he also made the outfit he's wearing in the above pics (one super talented dude) . And actually, the mask he is wearing is the one in the Apemania picture, second one from the bottom. He was lucky enough to pick it up when we were there. It was actually the only one Brian had at the shop at the time. Let me jump on the APEMANIA WAGON! First the qulity of the product is great but more importantly the void they fill has to be celebrated. Think of it, it's a one stop shop for any Ape fan and it's all licensed goods! Brian Penikas is a bonafied POA expert plus he's a fantastic make up man. His prices are very reasonable and the quality is unquestionable. Add to that, the fact that he is simply a great guy. Tim and Dave, your comments about the hair line are certainly valid. I would guess it's more an issue of manufacturing in the USA which certainly costs more but I suppose some steps have to be compromised to keep the mask saleable at a certain price point! Anyway, If there is any thing on here that you are interested in, contact Brian. Perhaps he could customize something for you.
" 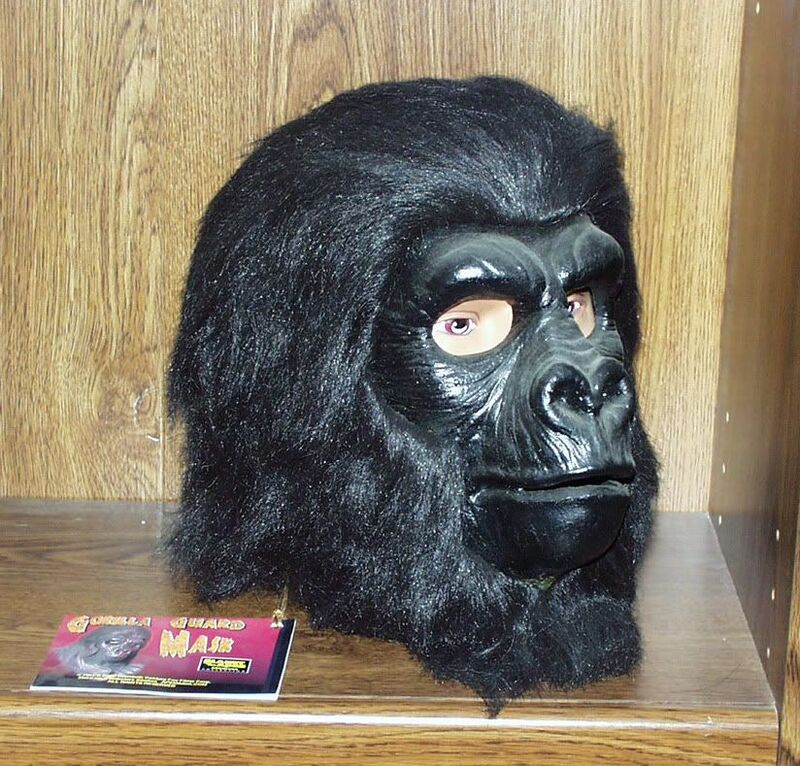 The only good mask ... Is an Ape Mania mask!! " I love Apemania! I almost picked up that Deluxe Ursus Display Bust a few years back. All of the display busts are killer..... That Ape-O-Naut is incredible.